Sporting and stylish, this watch, iconic to the brand, plays on contrasts and materials, and asserts a distinctly masculine vibe. 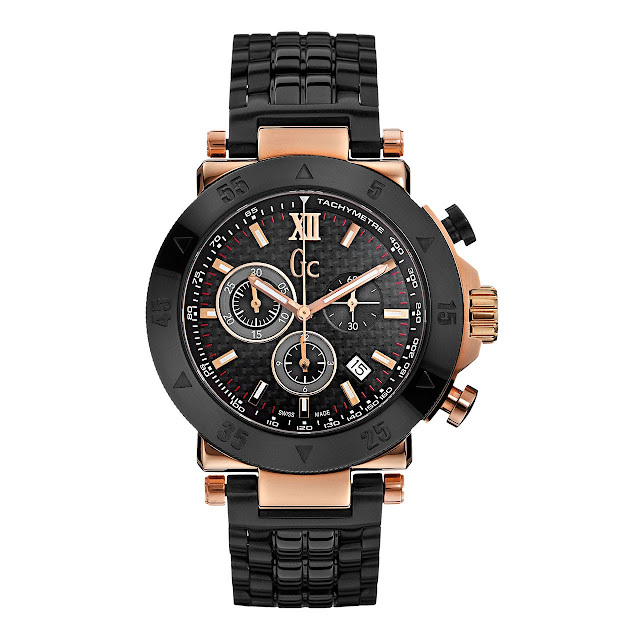 Bang on-trend, this contemporary Gc chronograph is both sophisticated and expressive. A stainless steel case with gold PVD treatment delivers stylish good looks while the sports allure comes from its textured silver or black carbon fibre dial, three counters, mushroom chrono pushers and a dynamic architectural bracelet in polished stainless steel or with black PVD treatment. Add to this a generous 44 mm diameter for a watch with a strong personality all its own.